Ceramics are inorganic, nonmetallic, often crystalline, materials made by the action of high temperature and subsequent cooling, similar to glass. They traditionally consist of hard, brittle, insulating, and corrosion-resistant materials. The word ceramic commonly evokes articles of earthenware, pottery, or porcelain made of clay minerals. Ceramics is one of the most ancient industries on Earth. The origins of the art and technique of making objects from clay and similar materials, treated by firing, can be traced back to as early as 24,000 BC. This ancient practice not only endured the consecutive rise and fall of different eras, but has evolved and secured its place in modern times. Currently, advanced ceramics engineering constitutes a major R&D opportunity. This article will discuss promising fields for advanced ceramics applications and the Federal R&D tax credit opportunity available for companies investing in eligible ceramics-related innovation activities. Ceramic's uniquely variable set of properties is an unquestionable asset in many industries and applications. Only a few decades ago, many of the current classes of ceramic technologies would have seemed inconceivable. Historically, ceramics have been utilized for their refractory (thermally insulating) and electrically insulating properties in applications such as spark plugs and dielectric layers of capacitors. However, modern ceramics discoveries have yielded materials with diverse electrical properties including standard conductors, ion conductors, and even semiconductors. These improvements have lead to a myriad of novel applications, for example, liquid and gas sensors and fuel cell technologies. Additional phenomena such as ferroelectric and magnetic properties have also been observed, resulting in memory storage uses in computing technologies and numerous types of superconductors. Despite their relatively high brittleness, ceramics have become a common material used in mechanical applications requiring enhanced hardness, or extreme wear, corrosion, and thermal resistance. Examples of these applications include structural elements, such as bricks, or high strength tools and equipment, bearings, and abrasives. Recently, tremendous research and development has been devoted to high temperature, low density ceramics for high efficiency turbines used in energy generation applications. These properties have also developed completely new and innovative applications for advanced ceramic materials. The chemical inertness and similar mechanical properties to natural bone have solidified ceramics as a primary choice for many biocompatible medical implants. The high strength and brittleness has been utilized in ballistics shielding, ranging from bulletproof vests to tank armor. As ceramics technology has progressed, it has become central to a variety of industries. The so-called advanced applications of ceramics are based on the specific thermal, electrical, mechanical, optical, magnetic, biomedical, and chemical properties of such materials. Examples include segments, such as electronics, transportation, military, and healthcare. 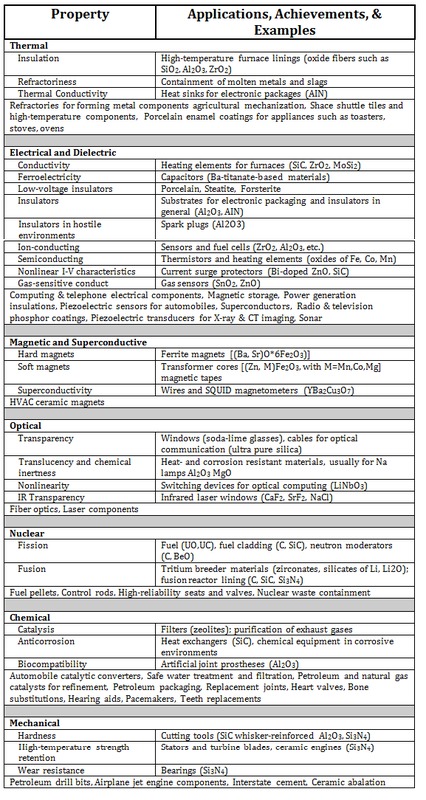 The following table, adapted from The American Ceramic Society, summarizes how ceramic materials contributed to the National Academy of Engineering's Top 20 Engineering Achievements that have had the greatest impact on the quality of life in the 20th century. Advanced ceramics studies have uncovered a number of new, diverse, and exciting functionalities of these "ancient" materials. Ceramics engineering is currently a field of tremendous activity and holds countless opportunities for innovation. Companies engaged in ceramics-related R&D activities may be entitled to significant Federal tax credits. The following paragraphs will portrait recent examples of ceramics innovation efforts. General Electric Co. recently announced the construction of a Ceramic Matrix Composites (CMCs) plant in Asheville, N.C. The 125,000 square feet facility will produce engine parts made of CMCs, which combine silicon carbide and ceramic resin. GE's investment on advanced composite materials is based on the anticipation of significant improvements over the traditional engine parts, made from nickel and titanium metal alloys. Advances would include increased durability and reduced weight, therefore resulting in fewer maintenance costs and lower fuel consumption. According to GE, long lasting concerns about the fragility of CMCs would be tackled by newly developed coatings and processing techniques. Their ultimate objective is to develop a new material that presents the heat resistance of ceramics and the strength of metal. The company's ambition is to increase the use of CMCs in its engines to 50% (from the original 10%). Recent advances are the result of over two decades of ongoing R&D efforts. Other branches of business, such as GE Energy and GE Oil & Gas, are also investing in the development of new compounds made of CMCs. Additive manufacturing, or 3D printing, is the revolutionary technology of building three-dimensional objects from digital models. This is achieved through an additive technique, which consists in superposing successive layers of material. 3D printed objects are usually made of plastics. PLA, or polylactic acid, and ABS, or acrylonitrile butadiene styrene, are currently the most commonly used materials. Ceramics, however, can play a major role in the bourgeoning 3D printing world. New York-based Shapeways, a company that allows costumers to print on-demand 3D objects, pioneered the 3D printing of customized ceramic objects. The idea is to explore a "food safe" material, encouraging the demand for household products. The printing process of ceramic objects consists of adding multiple layers of fine ceramic powder, which are then bound together with a binder, fired, and glazed with a lead-free, non-toxic finish. Due to the unique characteristics of ceramics, brittleness in particular, they remain one of the trickier materials to design for. Given the expected dissemination of 3D printing, R&D efforts are necessary to facilitate the design and production of ceramic objects. R&D opportunities also concern improved methods and processes. Inspired by ancient Egyptian Faience techniques, the University of the West of England is currently working on a self-glazing 3D printed ceramic. This innovative procedure would significantly simplify and cut costs of ceramic 3D printing. Nanotechnology promises to benefit society in countless ways. In the words of Stan Williams, Director of Quantum Science Research of the HP Laboratory, "Everything can be made in some way better (...) if it's engineered and manufactured at the nanometer scale." This could not be different for ceramics. The development of new nanostructured ceramics is a promising field for R&D efforts. Cornell University's Department of Materials Science and Engineering has been engaged in important research using a novel synthetic approach to explore new nanostructured ceramics. An example is the block-copolymer-directed silica synthesis leading to unusual structures, which can potentially improve ceramics performance for a number of applications. MemPro Materials from Broomfield, CO is yet another example of the combination of nanotechnology and ceramics. The company is currently working on the development of nanoscale ceramic fibers that conduct electricity. These tiny fibers can be added to other materials making them equally good conductors. If used in 3D printing materials, for instance, this technology can facilitate the production of circuit boards for cellphones and computers. The company plans to use this process to develop improved materials, including flame-retardant plastics, and catalysts to change biomass into fuel. Even though fuel cells represent an important alternative to energy production and combined heat and power solutions, their inherently high costs have been in the way of a more widespread adoption. Legacy fuel cell technologies, such as proton exchange membranes (PEMs), phosphoric acid fuel cells (PAFCs), and molten carbonate fuel cells (MCFCs), rely on costly precious metals, corrosive acids, and hard to contain molten materials. In this scenario, even combined heat and power schemes are hardly economically advantageous. Made of low cost ceramic materials, solid oxide fuel cells (SOFCs) stand out as a promising alternative. According to Bloom Energy, a Silicon Valley fuel cell start-up, "SOFCs operate at extremely high temperature (typically above 800 degrees Celsius). This high temperature gives them extremely high electrical efficiencies, and fuel flexibility, both of which contribute to better economics (...)." These same characteristics, however, also generate several engineering challenges. Important R&D efforts have been carried out to overcome the technical obstacles involved in the commercialization of ceramic fuel cells. SoftBank, a $70 billion Japanese technology investment company, has recently established of a joint venture with Bloom Energy, which will sell Japanese corporations electricity generated by fuel cells. Bloom's SOFCs use a thin ceramic wafer made from sand. They constitute a relatively inexpensive solution for Japan, an energy-poor country in the aftermath of a nuclear disaster. Ceramics, one of the world's most ancient industries, is now key to the development of a number of 'futuristic' technologies. Not only have advanced ceramics applications been central to major engineering achievements in the 20th Century, but they are also at the heart of important ongoing R&D efforts. From aviation to alternative energy production, ceramics represent a promising field for innovation. Federal R&D tax credits are available to support eligible ceramics-related innovation activities.